You aren't just born as fashionably bedazzling as a this unicorn turned out to be. In fact, it wasn't even born a unicorn! It still isn't really. Anyway, back to the story! Long Long Ago sounds quite like the start of a pleasent story, one to be read by a mother to her child, of tales of magic and dragon, princesses and unicorns. This story however is not one of those; it is one of utter randomness and incomprehensibility. One example of that would be the fact that I put 'incomprehensibility' in here. Another would be that Long Long Ago doesn't denote a time period but instead an island. The island was quite a normal place: flat, grassy and cold. The only thing in remote interest was a small pack of feral horses. Not even unicorns. Nobody lived on the island so the horses were free to roam at will...as long as they stayed on the rather small island. One day a young man rowed over to the island, tranquilized a horse and painted it rainbow colours along with adding a fake horn. Can you guess what he called it? 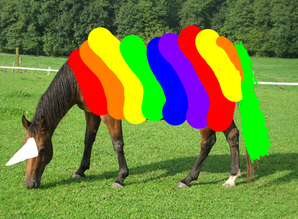 A Rainbow Unicorn. He's got a knife! Help me! This page was last edited on 5 January 2019, at 03:17.